This beef shawarma sandwich is a replica of one of my favorite Middle Eastern street food joints near Seattle. Tender, juicy shreds of seasoned meat, tangy pickles, and crunchy vegetables make a contrast of textures and flavors. Then it gets topped off with a douse of tahini dressing that makes this sandwich unbelievably delicious. Sop up the juices from the seasoned Shawarma beef with an extra slice of soft naan bread. You’re gonna need your napkin for this sandwich! Beef shawarma wrap with all the fixings. I really like this sandwich with as many fresh veggies as possible but one of the food trucks I go to serves it stuffed with french fries and pickles. Yep, I’m talking a hearty meat and potatoes kind of sandwich. If you’re like my husband, skip the veggies and fill your flatbread with the juicy shawarma meat, a fist-full of these air fried french fries, some dill pickles and a load of tahini dressing. You really can’t go wrong either way but I am going to persuade you to try the veggies. They make this sandwich an explosion of flavor. Shawarma is an Arabic term that means turning. It is a Middle Eastern dish of seasoned meat. Traditionally, the seasoned meat is placed on a type of vertical rotisserie that grills it evenly while it turns. Once the outside layers get nicely grilled, thin slices are carved off the slab of meat. You can serve shawarma as a sandwich or on a plate with tabouli salad, hummus, fresh veggies, and tahini sauce. It is also incredibly delicious with Lebanese garlic sauce and fried potatoes. What is the difference between gyro and shawarma? The main difference between a gyro and shawarma is the seasonings and the type of meat. 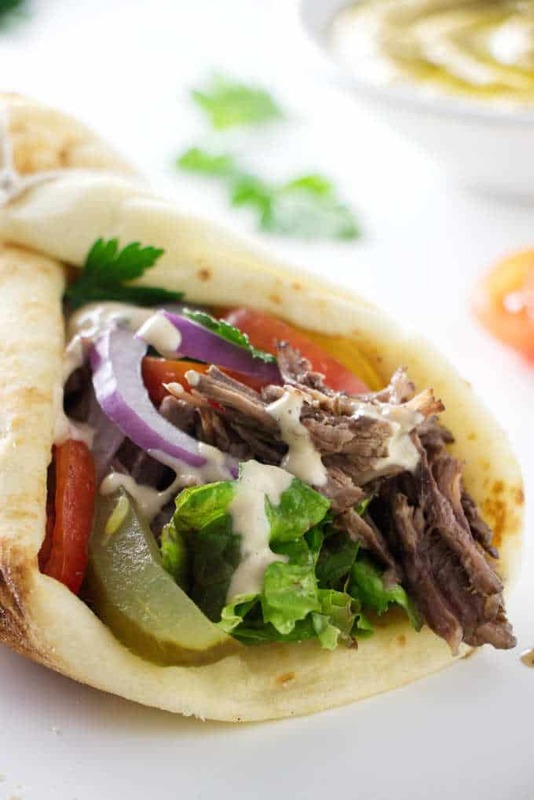 A gyro is usually made with lamb or a mixture of lamb and beef while shawarma can be made with any variety of meat like chicken, beef, lamb, or goat. There are only a few seasonings in gyro meat which mainly consists of salt, garlic, and onion. On the other hand, shawarma meat has a mixture of several seasonings including sumac, cardamom, cinnamon, pepper, allspice, nutmeg, and cloves. Shawarma meat is usually marinated for several hours prior to cooking and there are more variations to how it is served. For instance, as I mentioned above, you can find a shawarma sandwich wrapped up with french fries and only a few veggies or you can make it loaded with a wide selection of vegetables. Both gyro and shawarma meat get cooked the same way on a rotating vertical rotisserie and both words have the same meaning. Gyro is Greek for turning and shawarma is Arabic for turning. It is also more traditional to serve gyros with tzatziki sauce but not with shawarma sandwiches. 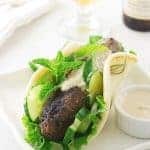 You will, however, see establishments serve shawarma with tzatziki sauce perhaps because of confusion over the two foods or simply because there is a fad for fusion food. Get your fixings ready for a beef shawarma sandwich! How to make a shawarma sandwich. 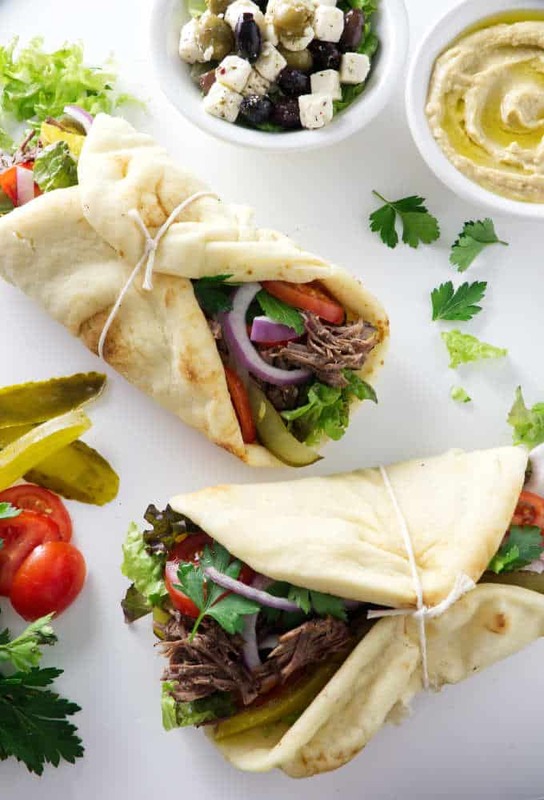 Check out our printable recipe below for detailed instructions for this beef shawarma sandwich. We included directions to either roast the meat long and slow in an oven or much faster in an Instant Pot. Both cooking methods produce super tender, juicy shawarma meat. 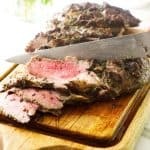 If you roast the beef in the oven it will take 3 hours but it will only take 45 minutes in the Instant Pot. When the beef shawarma is finished cooking, it will be so tender you can shred it with a couple of forks. These two methods don’t produce the same thin slices you see in a Lebanese restaurant that has their own shawarma rotisserie. However, both these methods are easy to do at home and the beef will taste amazing with all the shawarma spices. 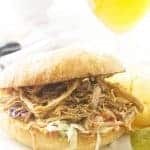 It is an accessible way to make shawarma meat at home. Tips for a great beef shawarma sandwich. Marinate the meat. 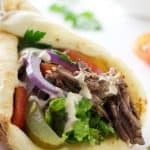 This beef shawarma sandwich tastes best if you prepare the marinade a day in advance and let the meat soak up all the flavors. Try to let it marinate for 2 hours but if you have time, let it sit overnight. Sear the meat. When you sear the outside of the meat it creates a caramelized crust through a chemical process called the Maillard reaction. It makes a big difference in the flavor of the meat and it only takes a few extra minutes. Don’t overcook the beef. The longer you cook the shawarma meat, the more it will break down and become easier to shred. However, there is a point that it starts to dry out. Don’t leave it in the oven or the Instant Pot longer than necessary. We have provided instructions to cook the meat long enough so it falls apart but still retains all the moisture. Warm the flatbread. You can use any kind of flatbread with this recipe. Heck, you can even use a tortilla if you want. We won’t judge. But you should warm the bread slightly so it will get soft and pliable. If you want to make your own flatbread, naan bread is easy to make. These German-style braised beef rolls are stuffed with a surprising ingredient. Learn how to cook a tri-tip roast in the oven with this recipe. 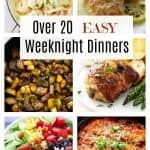 Add some baked potatoes and veggies for a perfect dinner. This beef casserole with garlic chive einkorn dumplings is a filling dinner. 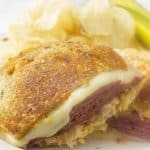 The dumplings are tender and fluffy and the casserole is loaded with big chunks of beef. 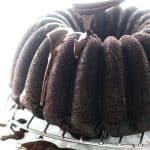 Check out our video above to see how to make this recipe in an Instant Pot or in the oven. 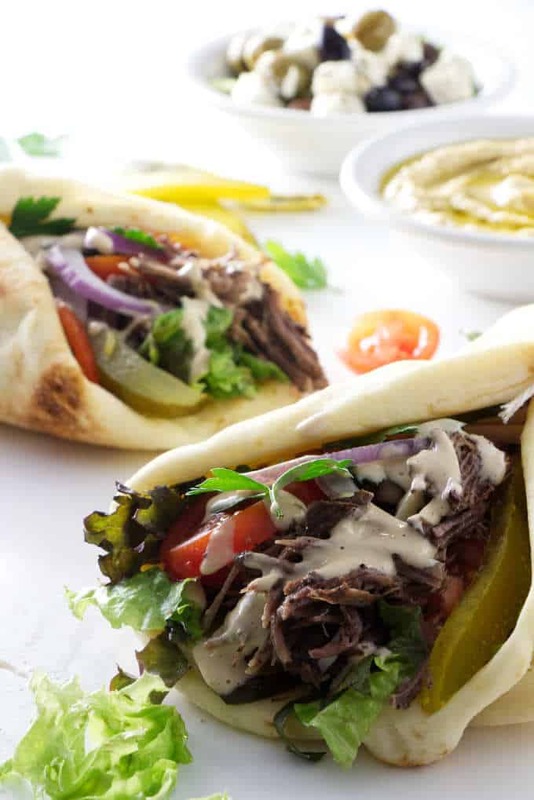 Tender, juicy beef cooked in a marinade of delicious spices gets wrapped up in a soft flatbread. Top it with crunchy vegetables, a couple of pickles and some zesty tahini dressing. Don't forget your napkin. Mix all the marinade ingredients together and place it in a large shallow dish like a 9 x 13 inch baking dish. Place the meat in the dish and turn it over so that both sides get thoroughly coated with the marinade. Cover the dish with plastic wrap and let it sit for several hours, preferably overnight. If the chuck steak is too large for the Instant Pot then slice it in half so it fits easier. Set the instant pot to sauté and add some oil to the bottom of the pot. When the pot is hot, sear the meat for about 4 to 5 minutes on each side until nicely browned. Add the rest of the marinade liquid to the pot along with 1/2 cup beef broth. Lock the lid in place and cook on high pressure (manual setting) for 45 minutes. Release the steam and shred the meat. Drizzle the juices all over the shredded meat. Heat a large skillet over medium heat. Add some oil to the hot skillet and sear the meat for 4 to 5 minutes on each side until brown. Add the rest of the marinade liquid to the skillet with the meat along with 1/2 cup beef broth. Place a lid on the skillet or cover it with aluminum foil and place it in the oven. Roast for 3 hours. Remove the meat and shred it with a couple of forks then pour the juices over the shredded meat. Get the flatbread warm by placing them in a microwave for 30 to 45 seconds or by sticking them in a hot oven for 2 to 3 minutes. Pile the shredded meat on the flatbread toppings of your choice. 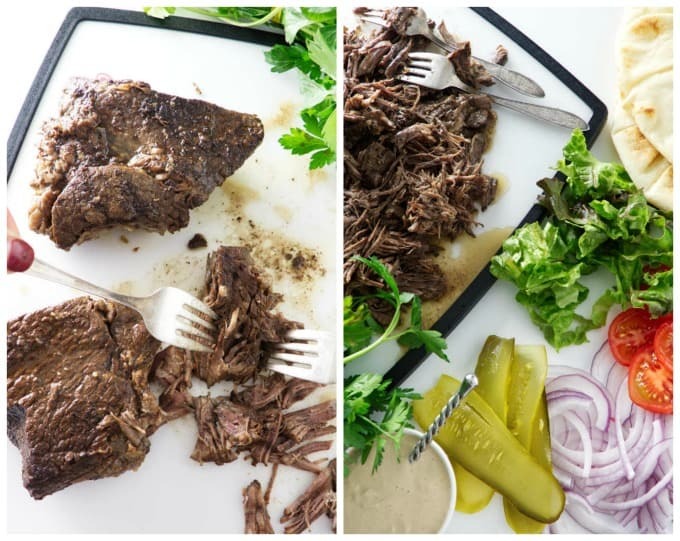 If you use the Instant Pot, it will only take 35 minutes to thoroughly cook the chuck steak but by letting it cook for 45 minutes, it will shred and break up easier for an ultimate shawarma sandwich. You can purchase shawarma spice mix at most grocery stores or make your own. 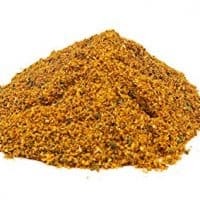 We provided a link to our shawarma spice rub if you want to make your own. Use tahini dressing, not plain tahini. Tahini dressing has a lemon/garlic flavor that goes perfectly with this sandwich. We provided a link to a homemade tahini dressing or simply purchase some in the salad dressing section.